The Electronic Frontier Foundation (EFF), a group that protects digital rights, has given Twitter and ISP Sonic.net full marks for protecting users data, according to its latest “Who Has Your Back?” report. Apple, Yahoo and Myspace were among the group deemed to be the least trustworthy. EFF’s latest annual report — the third of its kind — takes 18 mainstream US technology firms and reviews their approach to user data and rights, particularly in the face of government requests and demands. The companies are assessed over six separate categories, with a star given when they act in favor of users, and nothing awarded if they don’t. Do they require a warrant to provide access to content? Do they tell users about government requests for data? Do they publish transparency reports? Do they publish law enforcement guidelines? Do they fight for user rights in courts? Do they fight for user rights in (US) Congress? Twitter and Sonic.net came out top with six stars out of six, with Dropbox, Google, LinkedIn, Microsoft and data-back service Spideroak scoring four stars. Notable others include: Apple (one star), Facebook (three stars), Tumblr (three stars), Yahoo (one star). 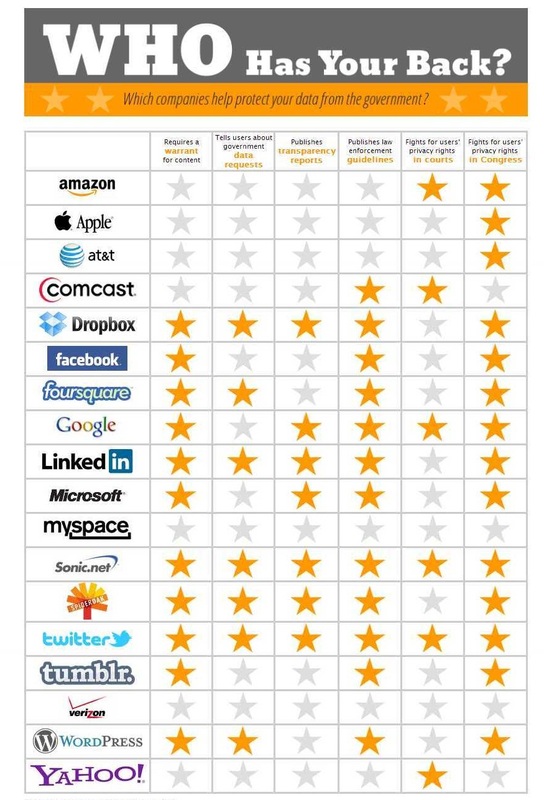 Myspace and Verizon were the only companies to be awarded no stars. EFF notes that this year there have been plenty of improvements. The past year has seen Twitter and Microsoft begin publishing transparency reports that detail government data requests — a trend given prominence by Google — and EFF Senior Staff Attorney Marcia Hofmann says that such reports have now become “an industry standard practice” for US tech firms. There’s a lot to celebrate in this report, but also plenty of room for improvement. Service providers hold huge amounts of our personal data, and the government shouldn’t be able to fish around in this information without good reason and a court making sure there’s no abuse. This report should be a wake-up call to Internet users that they need more protection from the companies they trust with their digital communications. Last year’s report — which didn’t look at whether companies required a warrant for data access — saw Sonic.net score a maximum score of four stars, while Twitter was awarded three and a half. The overview of data is below, you can read the report in full here.